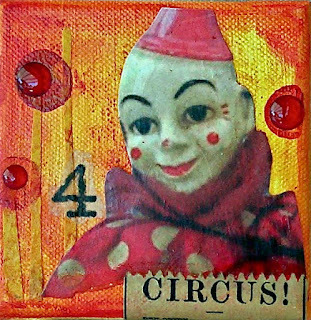 This little canvas is one of a clown series I'm working on. I love clowns, always have and never quite sure why some people have a feared them. What they should fear is the circus out there! This canvas earned it's title from thoughts of my yesterday. The holiday frenzy is in full swing and people are trying to multi-task more than ever and they're not good at it. Ever try to run a few errands on your lunch break the weeks before Christmas? It's like American Gladiators out there. I was so fra-dazzled. I just made this word up, it's state of being, cross between frazzled and dazzled, basically overcome by stimuli of all sorts, traffic, people, carts, glitter, holiday sounds and food. My only saving grace was I knew at the days end I'd be taking class to learn how to faux paint a unique burl wood design on wooden memory box using Ranger distressed inks, Memories stamp pads and satin varnish. Also learned was how to make minature journal books using an origami fold. I'll post finished product soon! Thanks for stopping by and hope you're not fra-dazzled. Be sure to visit my other blogspot: "ThE ArTful EyE"
Ahem...classes? You sneak!! I wanna see what you made!! Speaking of the holiday circus...I can attest first hand that people are the most ugly at this time of year even though they think they are all Mother Theresa's stunt doubles. Idiots.